In August 2014 the seasonally adjusted current account of the euro area recorded a surplus of €18.9 billion. In the financial account, combined direct and portfolio investment recorded net outflows of €19 billion (non-seasonally adjusted). The seasonally adjusted current account of the euro area recorded a surplus of €18.9 billion in August 2014 (see Table 1). This reflected surpluses for goods (€15.3 billion), services (€7.8 billion) and income (€4.2 billion), which were partly offset by a deficit for current transfers (€8.4 billion). 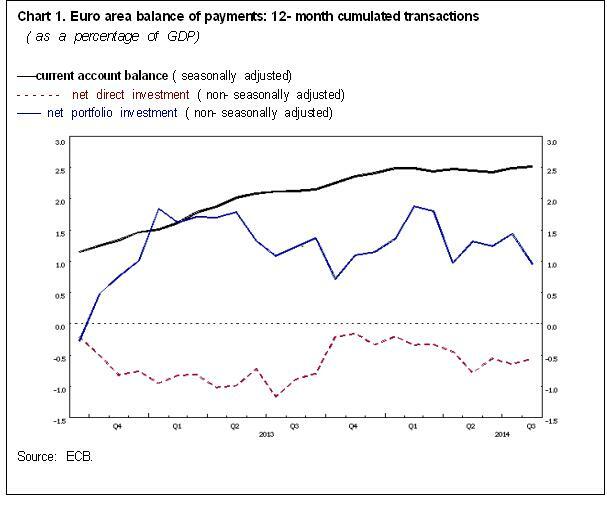 The seasonally adjusted 12-month cumulated current account for the period ending in August 2014 recorded a surplus of €242.9 billion (2.5% of euro area GDP), compared with €202.2 billion (2.1% of euro area GDP) for the 12 months to August 2013 (see Table 1 and Chart 1). The increase in the 12-month cumulated current account surplus was due mainly to increases in the surpluses for goods (€183.6 billion, up from €147.9 billion) and services (€120.1 billion, up from €102.6 billion), which were partly offset by a decrease in the surplus for income (€54.3 billion, down from €69.3 billion). The deficit for current transfers remained broadly stable. In the financial account (see Table 2), combined direct and portfolio investment recorded net outflows of €19 billion in August 2014, mainly as a result of net outflows for portfolio investment (€28 billion) which were partly offset by net inflows for direct investment (€9 billion). The net inflows for direct investment were a result of net inflows for both other capital (mostly inter-company loans) (€5 billion) and for equity capital and reinvested earnings (€3 billion). The net outflows for portfolio investment were accounted for almost entirely by net outflows for debt instruments (€49 billion), particularly for bonds and notes (€40 billion), which were partly offset by net inflows for equity (€21 billion). The financial derivatives account recorded net outflows of €13 billion. Other investment recorded net inflows of €17 billion, which mainly reflected net inflows for other sectors (€24 billion) and, to a lesser extent, for the Eurosystem (€6 billion), which were partly offset by net outflows for MFIs excluding the Eurosystem (€7 billion) and general government (€5 billion). The Eurosystem’s stock of reserve assets increased by €9 billion in August 2014 (from €585 billion to €594 billion), mainly on account of valuation effects (transactions contributed to an increase of €1 billion in overall reserve assets). In the 12 months to August 2014 combined direct and portfolio investment recorded cumulated net inflows of €39 billion, compared with net inflows of €33 billion in the 12 months to August 2013. This change resulted from lower net outflows for direct investment (€53 billion, after €84 billion) and lower net inflows for portfolio investment (€92 billion, after €117 billion). This press release incorporates regular revisions for July 2014. These revisions have not significantly altered the figures previously published. In this press release, the seasonally adjusted current account refers to working day and seasonally adjusted data. Data for the financial account are not working day or seasonally adjusted. In line with the agreed allocation of responsibilities, the European Central Bank compiles and disseminates monthly and quarterly balance of payments statistics for the euro area, whereas the European Commission (Eurostat; see news releases for “Euro-indicators”) focuses on quarterly and annual aggregates for the European Union. These data comply with international standards, particularly those set out in the IMF’s Balance of Payments Manual (fifth edition). The aggregates for the euro area and the European Union are compiled consistently on the basis of transactions and positions vis-à-vis residents of countries outside the euro area and the European Union respectively. Detailed methodological notes are available on the ECB’s website. For media enquiries, please call Rocío González-López on +49 69 1344 6451.